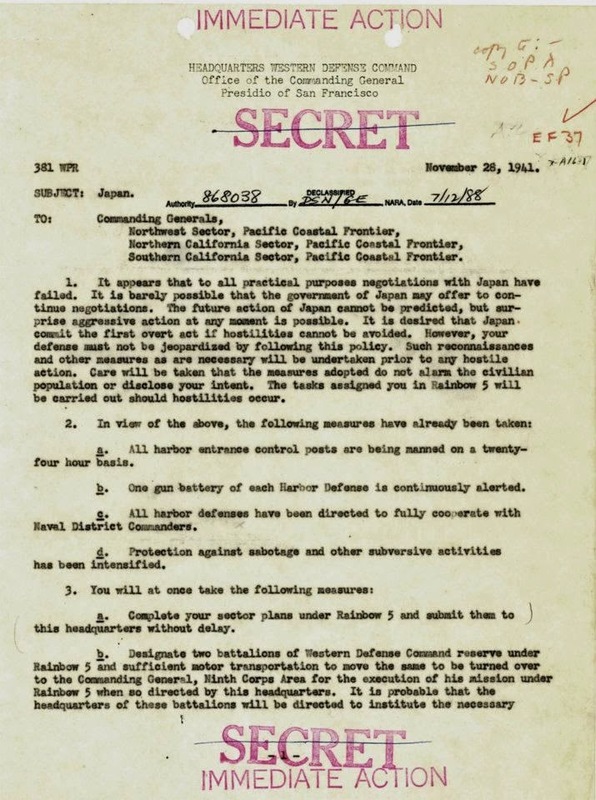 » Page 1 of a US Army alert order dated 28 Nov 1941 issued to west coast commands indicating the rising tensions with Japan. The first paragraph is a repeat of the alert issued by George Marshall in Washington, DC. This photograph has been scaled down; full resolution photograph is available here (715 by 960 pixels). Licensing Public Domain. According to the United States copyright law (United States Code, Title 17, Chapter 1, Section 105), in part, "[c]opyright protection under this title is not available for any work of the United States Government". Did you enjoy this photograph? Please consider supporting us on Patreon. Even $1 per month will go a long way! Thank you.